The Silver Dog With the Golden Tail. Will the Tail Wag the Dog, or the Dog Wag the Tail? This flyer supports the position of the populist Democratic candidate William Jennings Bryan on the critical issue in the 1896 Presidential race, "Free Silver." Bryan proposed a return to the free coinage of silver at a fixed ratio of 16 to 1 with gold, although the market ratio was in fact some 30 to 1. While few voters at the time (as now) understood the complex workings of bimetallism, both sides agreed that the Free Silver proposal would result in substantial inflation. Bryan and his supporters embraced such a consequence as a remedy for the Panic of 1893, a severe depression that had created high unemployment, falling prices and severe pressure on farmers. Free Silver would allow beleaguered farmers and others to repay debts with inflated dollars. Bryan's famous acceptance speech at the Democratic convention concluded by warning opponents: "You shall not press down upon the brow of labor this crown of thorns; you shall not crucify mankind upon a cross of gold." The Republican candidate, William McKinley, opposed Free Silver for precisely the reason Bryan supported it, arguing that a dollar would be worth just 47 cents and economic chaos would ensue. Supported by eastern business and financial interests, he characterized the election as "a struggle to preserve the financial honor of the government," urging voters to support "an honest dollar" and "an untarnished national credit." This flyer superimposes an outline map of the states on a fierce dog with an "Election" bone in its mouth. The southern and western farm states Bryan hoped to win are overlaid in silver. The industrial northeastern states likely to support McKinley are overlaid in gold, and five "doubtful" states are left white. 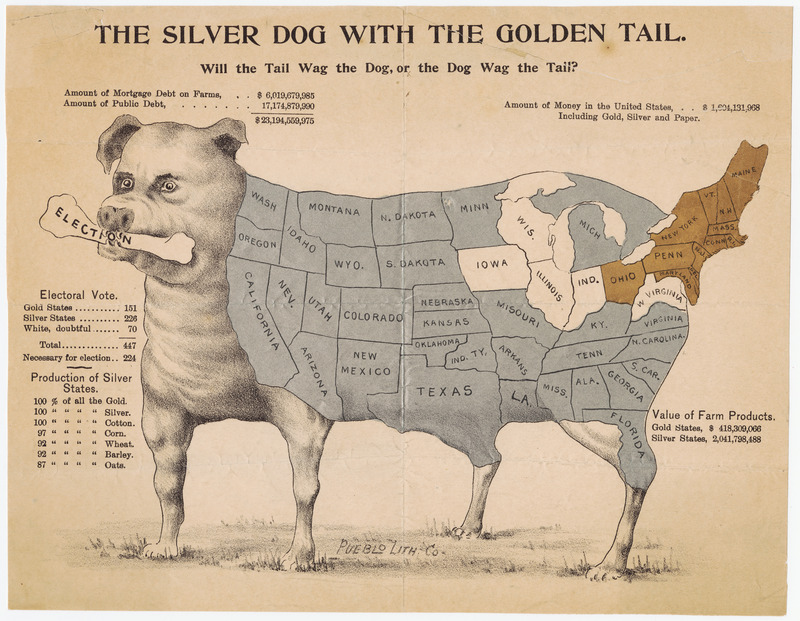 An "Electoral Vote" count shows that the "Silver States" alone would give Bryan the Presidency, assuring viewers that the Silver Dog would Wag the Golden Tail. In the end, McKinley won not only all of the "Gold" and "doubtful" states, but California, Kentucky, Michigan, Minnesota, North Dakota and Oregon, giving him an overwhelming electoral college majority (along with a 51% to 47% popular vote victory). Free Silver had less traction four years later in the 1900 Presidential election because the economy was in recovery, and McKinley defeated Bryan by a larger margin, only to be assassinated the following year. The United States remained on the gold standard until the 1970s, at which point it had become essentially irrelevant as a result of post-war international economic developments. The first version of this map appeared in the Boston Globe of September 13, 1896, and was quickly reproduced across the country. An article about the election results in The Review of Reviews reproduced the picture and called it, "A campaign poster much used in the west." ID #2055.01, "The Silver Dog With the Golden Tail" - And the Tail Wagged the Dog After All. The broadside here is unusual because it is not only in color, but features the gold and silver metallic overlays. I have found reports of only one other copy, this one with an added legend: "Compliments of Nuckolls Packing Co., Pueblo, Colorado." Lane 2001, 80. "This humorous map was created by supporters of the silver currency to make fun of the gold states and reinforce the community of the silver states. The map . . . portrayed an image of isolation of the 'golden states' associated with wealth (gold), by dissociating them from the body of the country/dog and associating them with the tail of the animal. . . . implicitly [arguing] . . . in favor of marginalizing the East Coast. Here, humor and maps are combined to generate a propagandist perspective of the U.S. nation-state, challenging the image of a country historically dominated by the wealthy East Coast elite. This humorous map was not sufficient to reverse this tendency or to impede the emergence of the gold standard. It contributed, nevertheless, in reversing the image of a nation dominated by the Northeast." Caquard 2008, 56. For persuasive maps concerning Bryan's presidential run in 1908, see ID ##2279.01-.02, "The Map of Bryanism" (1908) and ID #2282, "That Diminishing Blot on the Elephant" (1907).